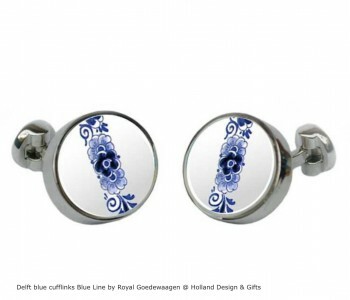 Unique and "typical Dutch": Delftware cufflinks "Delft blue line", a subtle design with a banner of Delft blue floral decorations. Designed and created by Royal Goedewaagen: contemporary design with a link to tradition. A refined and typical Dutch detail for your business outfit. Set of 2 cufflinks "Delft blue line" delivered in a gift box. To have and to give: A touch of Dutch! Delftware Cufflinks "Delft Blue Line"
Delft blue is not limited to tableware and vases as can be seen from this nice set of cufflinks "Delft blue line". A typical Dutch detail for your business outfit with a subtle, Delft blue decorated banner over the white ceramic. A set of beautiful cufflinks by Royal Goedewaagen, contemporary design with a link to the past. Set of 2 cufflinks "Delft blue line" in a gift box. To have and to give: Proud to wear Dutch! Royal Goedewaagen was established in 1984 in Nieuw-Buinen in Drente. However, the company has a long history. The story of Royal Goedewaagen starts in 1610 when the De Jong family from Gouda established 'De Star', a ceramics factory. This company eventually turned into Royal Goedwaagen, a company to which quality, craftsmanship, perfection, and creativity are of great importance. They are able to successfully reflect these values in their products. The company has been one of the leading players in the field of ceramics.